Savannah Irish Festival 2019 - Celebrate Irish Heritage in Savannah! « Save Your Place for Savannah Book Festival 2019! Savannah’s Irish heritage is deep, having begun arriving here on some of the first ships to the new colony in 1734. At least nine of the first colonists granted land in Georgia were Irish. After English, more Georgians can claim Irish ancestry than any other. Is it any wonder that our St. Patrick’s Day celebrations are the second largest in the nation? Though our annual Savannah St. Patrick’s Day Parade is famous, it isn’t the only celebration of Irish heritage in Savannah. In fact, Savannah spends an entire month celebrating the Irish, starting with February’s annual Savannah Irish Festival! 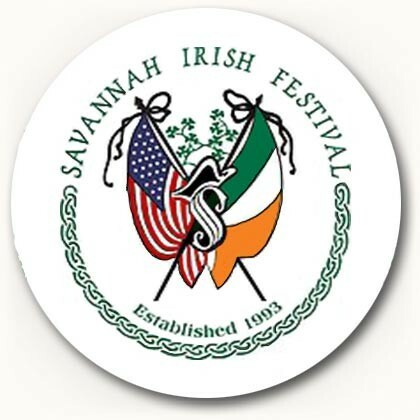 As I said at the top, this year’s Savannah Irish Festival is scheduled for President’s Day Weekend – February 16th and 17th, 2019. Savannah Irish Festival sees great entertainment in the form of top Irish musicians. Performers like the Seldom Sober & Savannah Ceili Band, The Byrne Brothers, SYR, and Harry O’Donoghue are already on the list of performers, with more to be announced, soon. Irish dance groups are also an integral and unforgettable part of the weekend. Last year’s festival featured four different stages of live entertainment! It’s not all just song and dance, either. Savannah Irish Festival also includes comedy, story-telling, art, crafts, and don’t forget food and drink! Smoked beef brisket, bangers, whiskeycake, Irish soda bread, and fish & chips are all on the menu. You’ll also see plenty of beer and liquor … just as an alternative to water, coffee and pop, of course. You don’t have to wait too long after Savannah Irish Festival 2019 for more Irish events in Savannah! Many others follow, starting with the annual Greening of the Fountain on Friday, March 8th, at 12pm in Forsyth Park. Other events in the queue include the Savannah Shamrock 5k, the Irish Heritage Dance, Shamrock Festival, Celtic Cross Ceremony, and of course, the Savannah St. Patrick’s Day Parade on March 16th. Learn about these events and more online at savannahirish.org. McMillan Inn is proud to be a part of Savannah and her wonderful history and culture. Our Savannah B&B offers true Southern hospitality in Savannah’s downtown Landmark Historic District. Let our lush guestrooms and extravagant amenities transport you to a more refined era. Book your stay at McMillan Inn today!